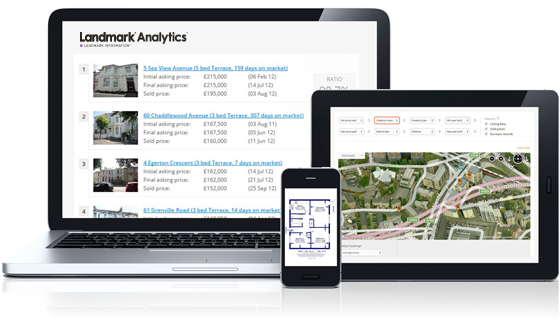 Landmark® Analytics is the UK’s leading provider of residential property market data, analysis and automated valuation services to all sectors of the UK economy, including government bodies, mortgage lenders, surveyors, estate agents and the general public. Our AVM reports provide you with an instant 15 page PDF valuation report for an individual portfolio of properties – complete with confidence level. Approved by leading ratings agencies, Fitch Ratings™ and Standard & Poor’s™ and the UK’s only ISO Accredited Provider. Our database includes: 90 million property images, 20+ million sold prices, 2 million surveyor records and an unprecedented level of historical listing and transaction data. Our powerful search engine and filters will deliver the comparable evidence you need in seconds. Search for individual properties & create bespoke, customisable reports with robust supporting valuation evidence with our Desktop Valuation Wizard. Get the full picture with essential demographical analysis & intelligent area heatmaps such as prices per square meter. Landmark® Quest™ is the UK’s leading provider of fraud detection and prevention solutions to the lending industry. Our proven analytical fraud solutions recently won the MFG Award for Best Anti-Fraud Measure. We work with our clients to provide bespoke solutions to address specific risk concerns. We are the UK’s leading digital mapping & geo-spatial data solution specialist & hold the largest historical digital archive in the UK. Specialists in planning and environmental risk. Ordnance Survey premier partner. We help organisations of all sizes to develop bespoke housing market research and analysis. We have supplied government bodies, national media, property and legal professionals, mortgage lenders and insurance companies with tailored business intelligence and data solutions. So how do we hold up against the competition? Our simple online solutions deliver you the UK’s most comprehensive & accurate property valuation and market intelligence, exactly what you need, when you need it. Whether you are a property developer looking for site intelligence, a Lender or Surveyor requiring an instant valuation, or an Estate Agent wanting to create bespoke market appraisal reports - one login to our online solutions will save you hours of research.